What would it be like if a band of all-star technicians took a “The Band” approach to classic Chicago Blues? 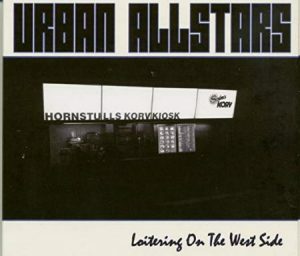 The answer is the Swedish Urban Allstars’ excellent 2016 Loitering On the West Side. Three fine lead singers (hello Levon, Danko and Richard) take turns laying down a historical reenactment of 50’s-60’s era Blues. A telepathic rhythm section plays with authenticity and depth just like Levon and Danko used to. A duel guitar front, replacing the Garth Hudson/Richard Manuel duel keys, play with styles indebted to Jimmy Rogers and Buddy Guy. Loitering On the West Side is a pure pleasure to listen to if you enjoy authentic, old-school Blues. This is not a solo artist bringing a band along on their specific trip like B.B. King and T-Bone Walker did. 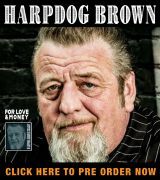 This is not a down home acoustic back porch song-pull like Jimbo Mathus or Corey Harris often preside over. This is not a retro swinging greased up throwback act like the indomitable Rick Estrin and the Nightcats. This record is a purely distilled egalitarian shot of group playing that shines because there isn’t a single stand out performer. This group dynamic is right in line with the excellent 50’s and 60’s Chess records. The Urban Allstars nail the classic Chicago aesthetic with their slavish adherence to authentic sounds. The guitar sounds are perfectly pure overdrive, none of the more modern distortion sounds that pop up so much in Blues Rock pedal-boards. The drums have lots of uncompressed headroom for cymbals to chime out and snare hits to expand. Coupled with the use of an acoustic double bass, the rhythm section injects air into the recording in a way that allows the listener to be in the room with the musicians. The material here is almost all covers but the song choices are not the obvious material. No “Hoochie Coochie Man” or “Howlin’ For My Darlin’.” Lazy Lester’s “They Call Me Lazy” has the original’s great slow drag. These guys dug deep covering 2 songs from the esoteric godfather of androgyny, and Little Richard influence, Esquerita (Eskew Reeder Jr.). “Laid Off” and “She Left Me Crying” are super fun romps and the Allstars let the material’s wit and charm shine through. Even the two more obvious covers work really well and sound fresh. A reworked Robert Johnson-light version of “Stop Breaking Down” attributed to a “J.L. Williamson” opens the album with a great Sonny Boy Williamson II feel. And, Albert King’s oft-covered “Blues At Sunrise” burns brightly in part due to a sharp and non-King like lead guitar performance. At 15 songs Loitering On the West Side is a little long. Because the sounds and material are so locked into a singular style and vision, things start to get a little repetitive if you listen straight through. This is isn’t an issue if you have the album in a mix, but you will have to download the CD because this record is not available digitally. However, find this CD and add it to your favorite Blues playlist. 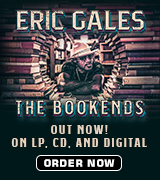 It is filled with buoyant, staggering and swaggering, foundational electric Blues. “Them Dangerous Gentleman,” as they call themselves in the liner notes, are: Thomas Grahn – vocals, harmonica, Thomas Hammarland – vocals, guitar, Cleas Parmland – guitar, Fredrik Von Werder – piano, Urban Hed – bass, Tommy Moberg – vocals, drums.